Jeff Gamsey of Boxed Wholesale, Mary Hines of Citi and Amanda Manna formerly of Lowe's Innovation Labs will deliver keynotes at the 5th annual CONNECT: The Mobile CX Summit. Early Bird registration ends Friday, March 23. Jeff Gamsey of Boxed Wholesale, Mary Hines of Citi and Amanda Manna formerly of Lowe's Innovation Labs will deliver keynotes at CONNECT: The Mobile CX Summit, August 13-15 in Chicago. As much as mobile devices such as smartphones, tablets and wearables have changed consumers' lives for the better, the technology also has caused angst for retailers worldwide. If you're confused by that statement, your company might be one of the many still lagging behind when it comes to providing what some consumers believe is vital to their everyday lives: a robust digital and mobile experience from their favorite brands. And consumers' expectations in this area get more demanding everyday as forward-thinking merchants adapt to emerging technology. By now, we're already well aware of the customer experiences brands such as Amazon, Starbucks and Uber provide on a digital level. But a company like Amazon also is making strides in the physical world with a bookstore chain and its much-discussed Go concept, not to mention pending Amazon integration at Whole Foods. That helps to bring consumers' expectations to an all-time high. So, what is a retailer, restaurant or other B2C company to do? Well, that's where Networld Media Group's annual CONNECT: The Mobile CX Summit can help. This year marks the fifth straight year of the summit. Last year, the theme was tweaked for the first time to focus more on the mobile customer experience to keep pace with emerging trends in the marketplace. That will continue in 2018. After a change in scenery in Philadelphia last year, the Summit is back in Chicago, August 13-15 at the Sofitel Chicago Magnificent Mile. Mary Hines, the global head of rewards for Citi, is this year's opening keynote speaker on Monday, Aug. 13 at 5 p.m.
Hines' keynote, titled “Fostering Next-Gen Brand Loyalty”, will highlight the crucial intersection of mobile and customer loyalty, discussing strategies to increase engagement, retention and brand favorability among target audiences. After Hines' keynote, stick around for the opening reception, which provides a great opportunity to meet speakers, sponsors and fellow attendees. The summit's second day will start with a keynote from Amanda Manna, former head of narrative & partnerships for Lowe’s Innovation Labs. In her keynote, titled "Using Creative Storytelling for Digital Transformation", she will will discuss how the team from Lowe’s Innovation Labs introduced an innovative approach rooted in narrative and neuroscience that led the Fortune 50 retailer to build augmented and virtual reality stores. This year, there will be a total of eight breakout sessions over two tracks, one will focus on marketing and one will be dedicated to IT/operations. Some of the breakout sessions include discussions about AI, chatbots, delivery, mobile messaging, mobile ordering and social media, among others. The day will end with a roundtable discussion about mobile payments strategy. This year's dinner party will offer attendees a unique experience at the nearby Chicago Sports Museum. The museum combines high-tech interactive experiences — including skill challenges and simulated experiences — with unique sports memorabilia and an impressive collection of game-used treasures and other artifacts. The 8,000-square-foot space celebrates all of Chicago's major sports teams. The interactive exhibits use body-tracking technology, allowing you to score goals as Blackhawks star Patrick Kane, shoot free throws as Bulls NBA Hall of Famer Scottie Pippen and many other one-of-a-kind experiences. The last day of summit begins with a CONNECT staple: the Brain Exchange. This 90-minute session offers attendees the opportunity to huddle up in groups to work with others at your table on a specific topic, hashing out best practices and things you've learned from the the summit's keynotes and breakout session. Jeff Gamsey, vp, private brands for Boxed Wholesale, will close out the summit with his keynote titled, "Best Practices for Building a Private Brand and Driving Loyalty in the Digital Era". He'll discuss how Boxed has taken the best elements of the wholesale shopping experience and folded it into a cutting-edge mobile app that allows consumers direct-to-their-door access to their favorite warehouse club products. Early bird registration ends Friday, March 16. Register here. Founded in 2000, Networld Media Group is a leading business-to-business (B2B) global media communications company specializing in digital media, associations and events in the mobile, self-service, digital signage, retail, food service and financial services industries. Online properties include ATMmarketplace.com, BlockchainTechNews.com, DigitalSignageToday.com, FastCasual.com, FoodTruckOperator.com, KioskMarketplace.com, MobilePaymentsToday.com, PizzaMarketplace.com, QSRweb.com, RetailCustomerExperience.com and BiblicalLeadership.com. Networld event properties include the Fast Casual Executive Summit, CONNECT: The Mobile CX Summit, Interactive Customer Experience Summit, Bank Customer Experience Summit and the Restaurant Franchising & Innovation Summit. Networld also operates the ICX Association. Its newest offering, Networld Press, provides clients with an all-in-one website solution featuring custom website design and ongoing editorial, content strategy and website updates. 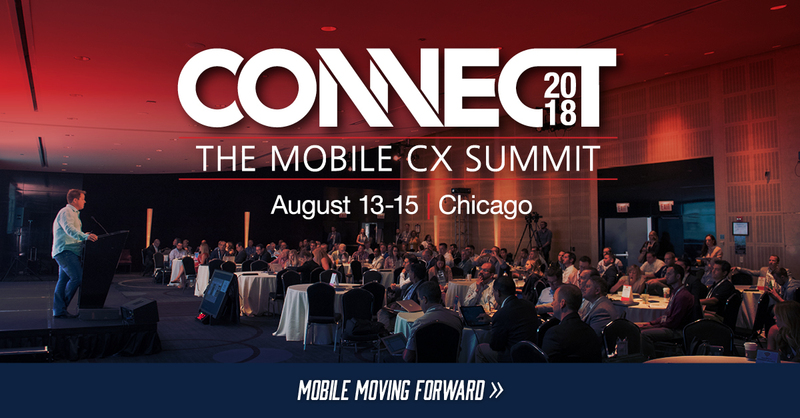 CONNECT: The Mobile CX Summit will be held in Chicago, August 13-15, at the Sofitel Chicago Magnificent Mile.